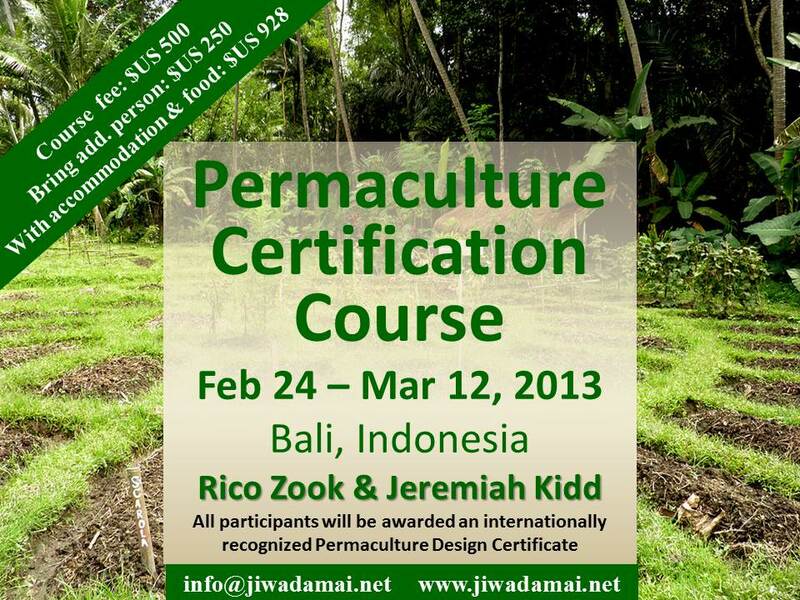 We at Jiwa Damai are extending an invitation throughout the world in hopes of reaching people interested in joining us in Bali for our Permaculture Certification Course, from February 24th to March 12th. Jiwa Damai is an agro-permaculture center located fifteen minutes outside of Ubud in the district of Mambal. The lush surroundings of the retreat center include a diverse array of flora and fauna that make it an ideal environment for students to be exposed to many different learning opportunities. In addition, we are also offering a 4 week internship, Permaculture Through The Heart, from May 1st - 29th. Participants have the option of taking each of the first two weeks separately if desired. Week 1 covers classical permaculture techniques. Week 2 is unfolding the HeartSelf-intelligence; an experiential transpersonal psychological approach to self exploration. These core principles will be combined for the final two weeks in the form of group and individual environmental projects. If you would like a more detailed description of our program, we invite you to visit our website through the link provided below.